Wanna know what climate change “looks like”? Extreme weather events are textbook examples of an effect that an overall warming of the planet will have. But since at least 1988, climate scientists have warned that climate change would bring, in general, increased heat waves, more droughts, more sudden downpours, more widespread wildfires and worsening storms. In the United States, those extremes are happening here and now. So far this year, more than 2.1 million acres have burned in wildfires, more than 113 million people in the U.S. were in areas under extreme heat advisories last Friday, two-thirds of the country is experiencing drought, and earlier in June, deluges flooded Minnesota and Florida. Of course, the far right believe that climate change is all a bunch of BS made up by lefties in some sort of vendetta against big business. And the far right is driving the government’s agenda right now with regard to environmental policies, so don’t expect any changes anytime soon. … in spite of the CPC’s best efforts to drive us in that direction. Six years into the Harper era, Canadians are inching inexorably into the conservative, and Conservative, columns. Right? And though not all are pleased with this incremental, rightward shift, most — the so-called silent majority — tacitly accept it. Well, no, actually. The latest data from pollster Ipsos Reid, part of a wide-ranging examination of popular sentiment for Postmedia News and Global Television, doesn’t suggest this at all. If anything the numbers indicate Canadians today are more solidly progressive than we have ever been. Perhaps we are a more complex and mature people than the received wisdom gives us credit for. And perhaps this means that our national political leaders, across the spectrum, don’t understand or reflect our views nearly as fully or as precisely as they might. I think that most Canadians – with the possible exception of the majority of those in Alberta – are firmly wedded to the core principles of social justice and are by and large a progressive bunch. We are also a conservative gaggle from a financial perspective; we want our governments to be fiscally prudent. 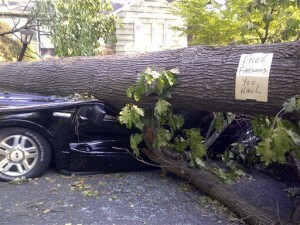 The Harperites are failing on both fronts, and as soon as there is a viable progressive alternative, they are screwed. Speaking of rodents, a squirrel followed me this morning for the full length of my walk to the bus stop (about 400 metres). It hopped along about 10 feet behind! 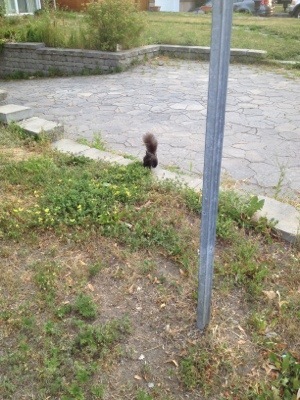 Then it sat in front of me on the sidewalk at the bus stop… staring expectantly. It was very weird! 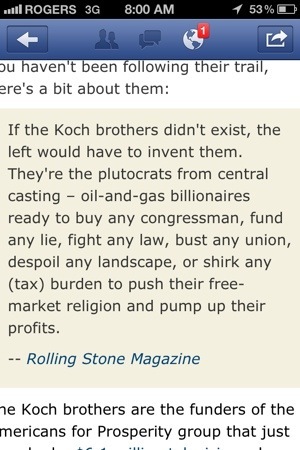 Again, speaking of rat-like critters, the slimy tentacles of the Koch bros. are everywhere it seems. They are spending 100’s of millions to try to oust Obama, plus they have funneled a cool half mill to the CPC’s fave “think tank”. Though “think” and Fraser Institute are two words that should seldom be used in the same sentence. Speaking of anachronisms: Yay. Catholic school labour peace is upon us in Ontar-i-ar-i-ar-i-o. But wouldn’t it be even more efficient if there were only ONE teacher’s union representing educators from ONE school system in Ontario? Learned a trick last night about Facebook. One can filter the number / type of updates that you get from specific friends. I’m already happy as hell about this as I don’t have to even so much as glance at some of the fluff that goes across my screen! The Onion Ring besting the PM is still getting attention. 95,544 fans as of the writing of this post. Of course, someone has started a counter group: Can this Doorknob get more fans than Michael Ignatieff. I might join the one other fan. Just to show I’m truly non-partisan. Craziness abounds… the Onion Ring fan club has grown to beyond 44K! Like I said before, this is a great example of how quickly a message – however a bit silly – can move along the social media stream. I will be interested to see how the mainstream media and politicians respond to this. My guess is that it will be more or less ignored. But really, Iggy or Harpy really SHOULD show up at a photo op with a box of onion rings! More than 44 thousand voters (or would-be voters) would get a kick outta that! All hail our Pungent Leader! Earlier this morning, I posted a scribble about the Facebook movement to sign up more “fans” for an onion ring than Stephen Harper can claim – and it looks like the goal may be met by the end of the day. – 20,246 – the last time I refreshed the page. An odd new campaign began in the last 24 hours on Facebook. The challenge: to pit an onion ring against Prime Minister Stephen Harper and see who gets more fans. As I write this, the onion ring is a good deal behind the Prime Minister — around 14,000 fans, compared to the nearly 30,000 fans of Harper. And what is the end game of this contest? I have no idea. Perhaps the gold ring has something to do with the Olympics. Or not.